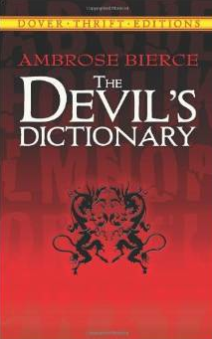 Humorist Ambrose Bierce began writing this book of satire at the end of the 19th century. Douglas Wilson is a modern theologian who makes heavy use of satire and argues that Jesus used it often. Satire helps us to take ourselves less seriously. Flannery O’Conner said: “Only if we are secure in our beliefs can we see the comical side of the universe.” Satire also is one of the ways Christians can attack false teaching—or at least blind spots of the guy in the pew next to us. Keep this in mind as I list a few of my favorite definitions. Christian, one who believes that the New Testament is a divinely inspired book admirably suited to the spiritual needs of his neighbor. Exhort, in religious affairs, to put the conscience of another upon the spit and roast it to a nut-brown discomfort. Hospitality, the virtue which induces us to feed and lodge certain persons who are not in need of food and lodging. Logic, the basic of logic is the syllogism, consisting of a major and a minor premise and a conclusion—thus: Major Premise: sixty men can do a piece of work sixty times as quickly as one man. Minor Premise: One man can dig a posthole in sixty seconds; therefore—Conclusion: sixty men can dig a posthole in one second. Mouth, in a man, the gateway to the soul; in a woman, the outlet of the heart. Overwork, a dangerous disorder affecting high public functionaries who want to go fishing. Plagiarize, to take the thought or style of another writer whom one has never, never read. Politeness, the most acceptable hypocrisy. Positive, mistaken at the top of one’s voice. Saint, a dead sinner revised and edited. This entry was posted in Book Reviews and tagged 2015 Review, The World by Paul Schlehlein. Bookmark the permalink.